Raccoons have kind of come into their own lately, and they’re a rather alluring and likable lot. 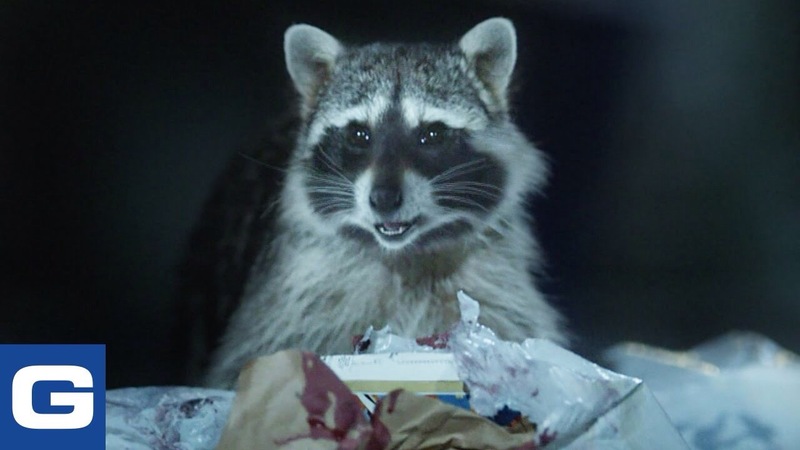 Rocket Raccoon in “Guardians of the Galaxy” was pretty awesome, and now Geico is treating us to a trio of articulate anthropomorphic ones who are dumpster diving at night. “Whoa! This is awful…try it!,” says one, encountering a repugnant morsel. “Oh no…that looks gross! – – What is it?,” responds a second. “You gotta try it. It’s terrible!,” counters the first. “I don’t wanna try it if it’s terrible,” reasons the second. “It’s like mango, chutney, and burnt hair,” describes the first raccoon. “Just try it!,” insists the first. “I can’t get this taste out of my mouth!,” complains the first raccoon. They’ll never be food critics, but you gotta love these guys! This entry was posted on November 20, 2016 at 8:27 pm and is filed under anthropomorphic, Brilliant but twisted, furry, furry commercials, television. You can subscribe via RSS 2.0 feed to this post's comments. Tags: Geico raccoons, You gotta try it! Uhhhhh, no. Not really. ;-). I prefer Brr’rrr (predecessor of Green Lantern C’hp).